DakhaBrakha - is world-music quartet from Kyiv, Ukraine. 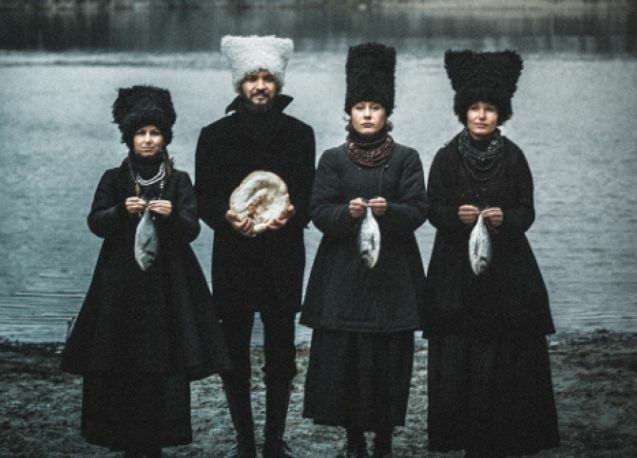 Reflecting fundamental elements of sound and soul, Ukrainian «ethnic chaos» band DakhaBrakha, create a world of unexpected new music. DakhaBrakha was created in 2004 at the Kyiv Center of Contemporary Art «DAKH» by the avant-garde theatre director - Vladyslav Troitskyi. Theatre work has left its mark on the band performances - their shows have never been staged without the scenic effects. Accompanied by Indian, Arabic, African, Russian and Australian traditional instrumentation, the quartet's astonishingly powerful and uncompromising vocal range creates a trans-national sound rooted in Ukrainian culture. Today's touring cast of Yemen Blues mainly based on Rony Iwryn, Shanir Blumenkranz & Ravid Kahalani with changing casts of top musicians & great friends from around the world. Each member comes from a different background and brings their own sound and arrangements to Ravid's compositions. The result of this amazing group is a powerful energy that mixes Yemenite, West African, Latin & Jazz influences and what Ravid likes to call "New Culture Music". The mambo and North African rhythms create a joyful and deep foundation, while the vocals remind the listener of ancient Arabic chants mixed with funk & blues. For their first album, the group collaborated with the well-known maestro Omer Avital who served as a musical director & producer. Since then, Yemen Blues keeps magic alive with a constant stream of new songs and their world-renowned exciting live performances! !